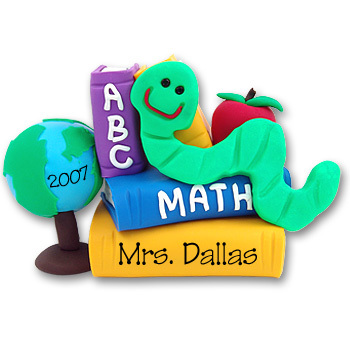 This is a great little personalized school ornament that can be used as an ornament or a figurine. It is three dimensional and can sit on a desk or hang from a tree. It comes with a hook and satin ribbon for hanging. What a wonderful gift for your favorite Teacher. This ornament is handmade from polymer clay.